Google unveiled Android P, its newest operating system, earlier this week at the annual Google I/O conference, where we got to hear about what’s coming next from Google. 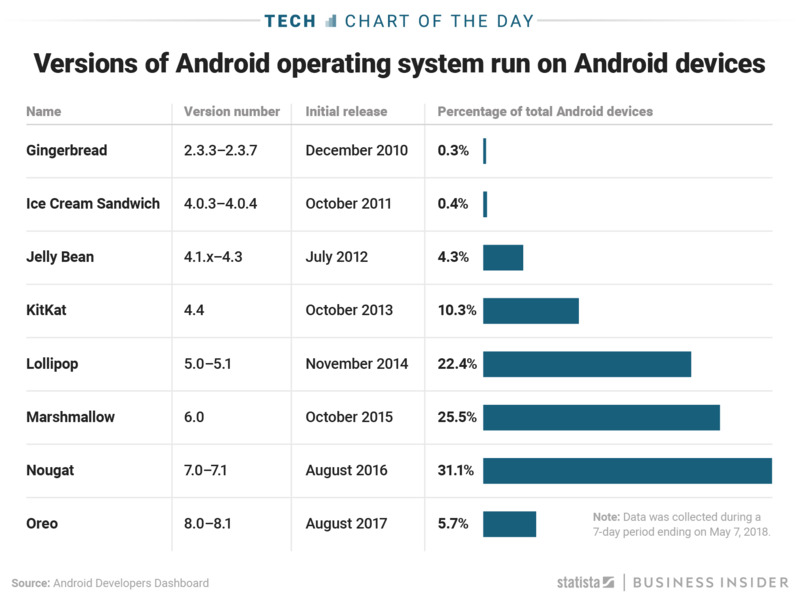 The new Android will come with a lot of new perks, including the much talked-about features that address smartphone addiction, but only a small fraction of current Android phones – about 5.7% of them – will be able to download the update when it becomes available. As this chart from Statista shows, Android’s very large share of the smartphone market is divided, with a majority of users on past versions Lollipop, Marshmallow, and Nougat (Android names its operating systems after sweets and in alphabetical order, meaning Android P will probably be named after a treat started with the letter P). If Android P were to become available today, only Android Oreo devices would be able to receive the update – but even then, it’s up to the manufacturer to roll out the software update. Unlike iOS, which is only in Apple products, Android is made by dozens of different manufacturers – Samsung, LG, and OnePlus, to name a few. 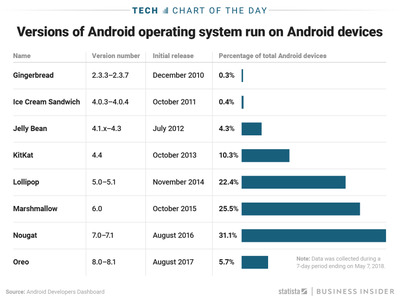 While Apple has the ability to push upgrades on all iOS devices at the same time, some manufacturers that use Android are slower to make the changes than others. So when Android P rolls out, only a fraction of devices will be able to take advantage of Google’s focus on “digital wellbeing” and its new AI-powered adaptive features.